1. I ordered new glasses and prescription sunglasses last week, and should be able to go pick them up tomorrow. I'm more excited than normal because my current glasses have big scratches in each lens, and I don't love wearing contacts every day the way I used to. I'm also excited because I branched out and got reddish frames for my everyday glasses. 3. A friend of mine got a tattoo for her birthday this week, and it's got me itching to get another one. I've got an idea for what I want next, and I've even settled on where. Now I just need to save up the money (or maybe wait and ask for my birthday). 4. The past few weeks, I keep thinking "I'm going to write a nice, long blog post. Something semi-deep or thoughtful." But honestly, the past few weeks my creative brain has been going too many directions, and by the time I sit down to write some kind of leisurely blog post...there are no more ideas in my head. 5. This Dark Road to Mercy by Wiley Cash was absolutely fantastic. Descriptive prose, compelling characters, and a deep sense of place. Right now I'm reading a book for Indie Reader and it's...not my favorite, to say the least. I've got Audacious by Beth Moore next up on my list for non-fiction, and for fiction I'm looking at Reading the Sweet Oak. It's a library book sale find, so I know basically nothing about it except I liked the cover and the blurb on the back sounded like it was worth trying out for a dollar. 6. Jeremy and I saw two movies in the theater this month! I can't remember the last time that happened. The first movie was almost an accident -- we'd scheduled a babysitter, but then our plans fell through. We didn't want that babysitting to go to waste though, so we decided to see a movie. Jumanji was exactly the kind of fun entertainment I expected, and truly laugh-out-loud hilarious. The second movie was Marvel's Black Panther, and it was amazing. Even if you don't like superhero movies, it was still amazing. From top to bottom -- visually stunning, well-plotted, great character development and dialog, fantastic action scences, thought-provoking themes, and the actors! I liked every minute of it. p.s. full disclosure, the links above are Amazon affiliate links, meaning I get a few pennies if you decide to buy one of those books through the link. 1. Is there a term that is to technology what a black thumb is to gardening? If so, I may have one. This past week my Kindle broke (maybe have gotten stepped on my a child, but I have no proof) and I lost my phone in a Walmart on a Saturday. So...it's good and lost. I really just hate spending money on new stuff when the old ones were perfectly fine. And it's a little sad since that's the only Kindle I've ever had -- it was a gift from my parents, and I think a first or second generation. So on the bright side, you could say it lived a full and useful life. 2. I just finished a fantasy series last week: The Elk Riders series by Ted Neill. It's one I mentioned a few weeks ago -- a series I've been reviewing for IndieReader. I enjoyed the last book quite a bit, despite the fact that the ending wasn't quite as wrapped up as I'd have preferred. I don't mind an open ending, but there were some plot lines and story arcs that felt a bit abandoned. Overall, though, if you like fantasy with great characters and lots of action it's a good one. I also finished a re-read of A Wrinkle in Time, which I don't think I'd read since junior high. Still loved it! Even with (or maybe because of) the dated references and tone. I'm interested to see how they adapt it for film, especially with a modern audience. My next fiction read is This Dark Road to Mercy by Wiley Cash. I'm also planning to pick up Beth Moore's Audacious, which has been languishing on my nightstand. 3. I wonder how long it will take my kids to realize that their non-crafty mama is not going to be putting together cute and/or elaborate Valentines for them to take to their friends/classmates. I wonder when or if it will bother them that I'm pretty content with just cute cards. 4. You know what I miss -- mix tapes. (Or mix CDs). For personal enjoyment, of course digital playlists are much easier to put together. I guess to be more accurate, what I miss is the sharing of mix tapes -- putting together a curated list of songs that mean something special and handing it off to a friend. Sharing your thoughts and feelings in a unique way. Sure, you can share playlists, but it's harder because not everyone uses the same platform to listen to music: Spotify (subscription), iTunes, Amazon, platforms I don't even know about. Maybe it's not as difficult as it seems to me. Maybe I just need to get some tutoring. 5. Speaking of music listening...what do my music-loving-non-iPhone-using friends use to listen to music on their device of choice? Specifically...what do you use to listen to music that you own? Even more specifically...what do you use to listen to music that you bought such a long time ago that it currently resides on a flash drive and on a CD? Right now I mostly use the Amazon music player app because that's where I buy most of my music, but sometimes I wonder if there's a better solution. p.s. the book links are Amazon affiliate links, which means if you happen to buy through the link I get a few cents back from Amazon. My friend Rita sent me Hotel on the Corner of Bitter And Sweet after I gushed about a book she'd recommended to me months ago (The Girl in the Blue Coat, which I talk about here). I remember when it came out, because it was very popular at the public library I worked at, and one that I actually handed off to patrons on occasion, although I'd never read it myself. I'm so glad Rita sent it though, and put it back on my radar, because it's a beautiful, quiet book about a difficult and complicated time in history. Henry Lee is a first generation Chinese-American. In 1986, he is recently widowed, the father of a son who is about to graduate college and with whom he wishes he had a closer relationship. One day, he's walking home through Seattle's International District, and witnesses a discovery made by new owners renovating the old Panama Hotel: a basement full of belongings stored and subsequently abandoned by Japanese-American's interned during World War II. The Panama Hotel, standing between what was once Seattle's Japantown and Chinatown, now a possible resting place for some of Henry's most closely held, bittersweet memories. The story is told half in 1986, and half in the 1940s, and the height of World War II. It tells the story of a boy who is both too Chinese and not Chinese enough and whose father diligently follows the war between China and Japan. Of a second-generation Japanese girl whose family is proudly American, but viewed with suspicion and hate. It's the story of unlikely friendships, divided loyalties, fathers and sons, and jazz. It's a story of the fear of a people at war, of miscommunication, love, and commitment. Although I knew that Japanese-Americans were sent to internment caps during World War II, this story makes those facts more personal, tangible, and consequently heartbreaking; yet it's also a story of hope. 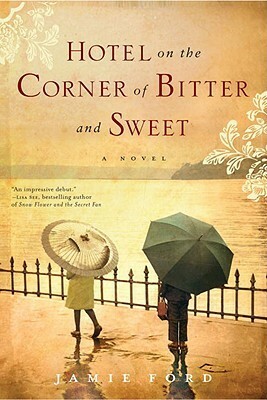 Hotel on the Corner of Bitter and Sweet is a fantastic read for anyone who likes historical fiction, family stories, or coming of age books. p.s. full disclosure of trying something new: if you order anything through one of the Amazon links, I'll get a tiny kickback through their affiliate program.